Some mothers and daughters bond over shopping. 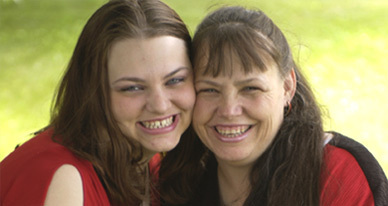 Margie Hartmann and her daughter, Jessica McNeil, bonded over Gamma Knife surgery. Hartmann and McNeil had the treatment — a type of neurosurgery that doesn't require an incision — on the same day at Mayo Clinic, for different conditions. Hartmann had a recurrent meningioma, a slow-growing tumor. Although meningiomas are almost always benign, they can be difficult to remove completely and can recur. Hartmann knew just who to call when she got the news: Bruce E. Pollock, M.D., a neurosurgeon at Mayo Clinic in Rochester, Minn., who had provided care for McNeil several years earlier when she was diagnosed with an abnormal tangle of blood vessels in the brain (cerebral arteriovenous malformation or AVM). Back then, Dr. Pollock suggested treating McNeil's AVM with Gamma Knife surgery in two treatments six months apart. The procedure uses gamma radiation to destroy diseased tissue in the brain and skull while preserving healthy tissue. "After Gamma Knife surgery for this condition, it takes one to four years for the complete effect of the procedure to occur, so we monitored Jessica's AVM with yearly MRIs during that time," says Dr. Pollock. During one of her follow-up exams, an MRI detected a small amount of blood still flowing through the AVM. Dr. Pollock advised doing repeat surgery. Coincidentally, that's when Hartmann needed the procedure. Mother and daughter decided to have surgery at the same time. "I was more comfortable with my mom having it on the same day I had it," says McNeil. "She had been there for me when I had the procedure before, and now she'd know what I had been through." Both McNeil and Hartmann were able to go home the day of their procedures. They're doing well, and now do their mother-daughter bonding in more traditional ways.